Disclosures: Member of the advisory board for Johnston and Johnston, Suneva. Member of the Speaker’s bureau for Johnston and Johnston. No conflict of interest. Pyogenic granulomas or lobular capillary hemangiomas are common acquired vascular tumors accounting for 0.5% of all skin nodules in children. They occur predominantly on the head and neck. Although they are benign vascular proliferations, treatment is often sought because of recurrent episodes of bleeding due to a propensity to superficial ulceration and bleeding. Although the pathogenesis of pyogenic granulomas is not completely understood, it has been hypothesized that they develop as a form of aberrant healing response to local tissue hypoxia or trauma. Existing treatment modalities for pyogenic granuloma of childhood are far from ideal. Procedural options have included cryotherapy, excision with primary closure, curettage, shave removal, electrocautery, injection of sclerosing agents, and a variety of laser modalities. Unfortunately, surgical excision commonly results in long-term scarring and usually requires a general anaesthetic in young children. The other existing alternatives, such as curettage and cautery, cryotherapy and laser may require multiple treatment sessions and carry a risk of scarring, pigmentary changes and recurrence (1). Nonsurgical options, including the use of topical imiquimod or silver nitrate, provide a variable response and may be complicated by dermatitis (2). The recurrence rate after treatment varies and can be as high as 15%, with surgical management having the best response and lowest recurrence risk. Unfortunately, the surgical options may cause scarring and may provoke pain and anxiety in children. A medical therapy that is painless for the child, easy to use and inexpensive would fill a much needed role in the treatment of pediatric pyogenic granulomas. In 2014, a group of investigators demonstrated that the use of a topical beta blocker, timolol, three times a day on lesions of pyogenic granulomas, significantly reduced the size of pyogenic granulomas over the course of weeks to months and was effective in stopping further bleeding episodes (3). B-blocker therapy was offered to patients with recurrent pyogenic granulomas and those whom were hesitant to undergo removal procedures. Six patients with pyogenic granulomas of the skin opted for treatment with topical β-blocker therapy. An additional patient with a mucosal pyogenic granuloma who had not responded to multiple treatment modalities was treated using systemic propranolol. Response times were variable, but all lesions treated showed at least a partial response by 2 months. In cases that presented with bleeding, treatment with topical timolol resolved further bleeding almost immediately. In many cases the bleeding was the patient’s main concern, and resolution of the bleeding led to high patient satisfaction with the treatment. Considerable interest in the use of beta blockers for vascular lesions started when Leaute-Labreze et al reported the efficacy of oral propranolol in the treatment of hemangiomas of infancy. Subsequently, studies on topical β-blockers, such as timolol, demonstrated a positive effect in the treatment of a subset of hemangiomas. Beta-adrenergic receptors on vascular endothelial cells cause peripheral vasodilation, activate proangiogenic factors such as vascular endothelial growth factor (VEGF) and basic fibroblast growth factor (bFGF), and inhibit endothelial cell apoptosis. Blocking these actions may help explain the effectiveness of topical timolol in pyogenic granulomas. The variable effect and time to resolution of pyogenic granulomas treated with topical timolol may be explained by the fact that pyogenic granulomas have a weaker expression of three critical beta-adrenergic receptors. Since timolol is a hydrophilic molecule, there is poor percutaneous absorption with a very low risk of systemic effects. Pyogenic granulomas are benign vascular tumors, and although surgical treatment is generally curative, patient age, lesion location, and recurrence risk may present challenges to optimal treatment. Topical beta-blockers are a promising new primary or adjuvant treatment for pyogenic granulomas given their superb safety profile. 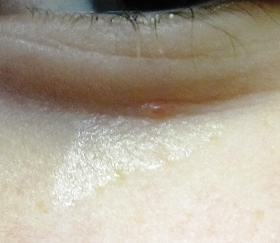 For all pediatric patients who present with bleeding or non-bleeding pyogenic granulomas, I offer the option of topical timolol three times a day, which would be a slower, but still effective and non-surgical option to prevent bleeding episodes and to hasten resolution of this common, benign but problematic (due to spontaneous bleeding) vascular lesion. Given the low propensity for any adverse effects, this would be a reasonable treatment for any practitioner to initiate, as long as the diagnosis of a pyogenic granuloma is certain. The bottles are specifically designed to dispense 0.05 mL/drop, and at a concentration of 0.5%, each drop contains 0.25 mg of timolol. Since timolol is in a lipophobic vehicle, very little gets absorbed systemically. However, if it is on a mucous membrane (i.e. eye), systemic absorption can occur. The data with topical timolol use in infantile hemangiomas shows it is safe to use for long periods of time, i.e. > 9 months of therapy (4). In pre-term infants, because of the increased risk of transcutaneous absorption, more caution is required (note: pyrogenic granulomas are rare in the neonatal period). 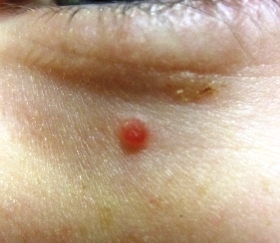 However, in a recent study, there were no adverse effects documented when the timolol was used for hemangiomas in older infants (PMA >40–44 wks) and in a dose less than 0.2 mg/kg/day, even when applying timolol to eyelid skin or mucosal sites (5). I am retired but a nice bit of new advice! Impressive results. Appears like a perfect first-line choice. Interesting and well worth a try. How do you keep the drop on the skin? Rub it in? Cover with bandaid? Just let the excess drip off?